This article explains what each field is and does under the Security tab in system setup. Password Control lets you configure options for your staff logins their password; including if you want to use User Logins for Staff PINs - if this is enabled, user logins have a PIN for the gate attached to them. This will then download to all facilities the user has access to (this is instead of the facility-by-facility staff PIN system, which most companies use). You can also force users to use complex passwords, including requiring a minimum password length, and options for password expiry. 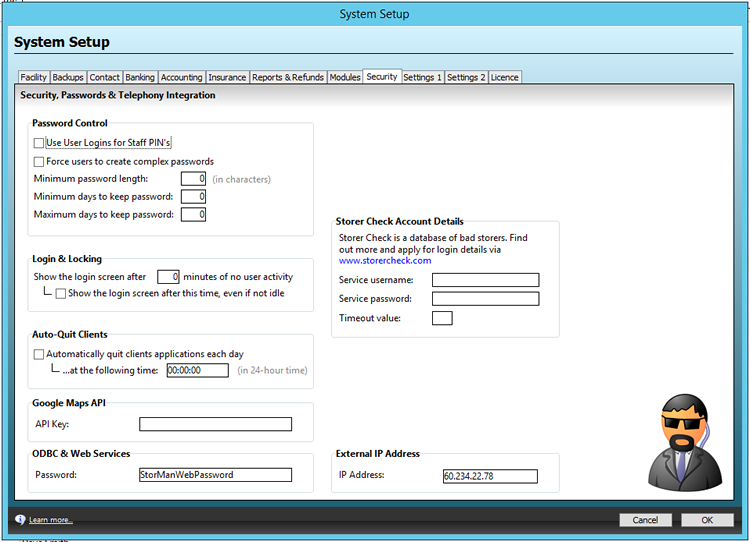 The Login & Locking section is used to define settings for the login prompt that you can use to "lock" Storman when the computer is unused. You can also set idle timing options here. Enter your API key into the Google Maps API section if you want to enable support for Google Maps in Storman. Note: There are currently no areas of Storman that make use of this feature. If you are connecting to Storman via our range of API's, set the ODBC & Web Services password here. The Telephony Integration section allows integration via TAPI from Storman to a users phone system. Using this requires the purchase of a 3rd-party hmTAPI licence. Enter your account information into the Storer Check Account Details section to connect your system with Storer Check, so that you can check for bad storers. Please ask your local Storman Support office if you wish to use this module.